A meeting of Indian government officials and telecom operators to discuss restricting the use of BlackBerry services was "inconclusive," Reuters reported without naming its sources. The group met Thursday to discuss how authorities could access data transmitted on the smartphone, which is made by Canada's Research In Motion (RIMM). Like several countries in the Middle East and North Africa, India is concerned that the encrypted service could pose a security threat. At least one telecom operator attended the meeting held by India's interior ministry today. 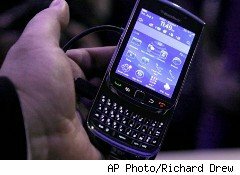 On Wednesday, a government official said that authorities could ask mobile phone operators to block BlackBerry messaging and e-mail services if RIM would not provide encryption details. That would leave BlackBerry users with access to Internet browsing and mobile phone services only. The shutdown would affect one million of the world's 41 million BlackBerry users.